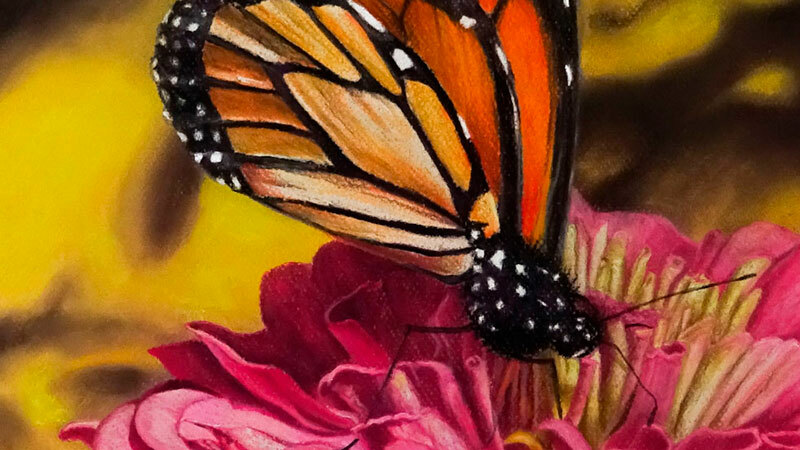 Learn how to draw a butterfly with pastels and pastel pencils in this eight-part live lesson series. 10 of my very best tips for drawing and painting with soft pastels. Learn the tools of the trade in pastel landscape drawing in this members only video series. Learn three different approaches to drawing with pastels including the techniques of blending, scumbling, and feathering. Learn the difference between warm and cool grays, how to mix them, and when to use them in your art. Learn how to draw a portrait with pastels and pastel pencils in this complete lesson series. Learn how to paint a realistic eye using Rembrandt pastels. Learn how to draw a portrait with soft pastels in this two part video series. Draw a realistic portrait using oil pastels in this full length recorded live lesson. Learn how to paint an Impressionist landscape with oil pastels. Learn how to paint a tree with pastels. The goal is to draw the entire image from start to finish in just 30 minutes using PanPastels and colored pencils. Paint a loose and colorful Autumn tree with pastels and use matte medium to create an underpainting. 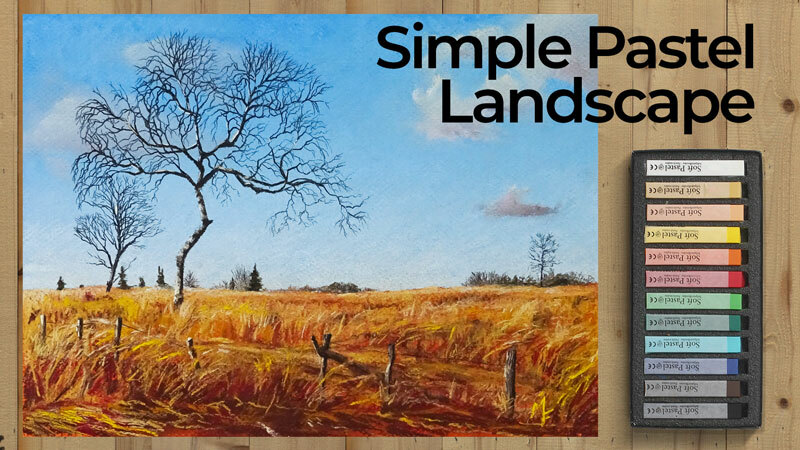 Learn how to draw/paint an Impressionistic landscape with oil pastels in this lesson series. A series of recorded Live Lessons on painting a landscape with oil pastels. Learn how to draw a winter landscape with pastels in this lesson. Paint a dramatic sunset scene with pastels. Learn how to paint a landscape with soft and hard pastels. Learn how to paint a landscape using PanPastels. Take advantage of the strengths of PanPastels and traditional soft pastels to create a landscape painting. A series of recorded Live Lessons on painting a landscape with PanPastels. Learn how to draw a seascape with pastels in this course module from "The Secrets to Drawing". Learn how to draw a landscape with oil pastels in this lesson that covers the basics of oil pastel painting. Learn how to paint quickly with pastels. Learn how to use oil pastels to create the illusion of water ripples in this recorded Live Lesson. How to find the right mark to create different textures with pastels. Learn how to draw ocean waves in this tutorial in the medium of chalk or soft pastels. Learn how to draw clouds in a pastel landscape in this tutorial. A look at a few techniques for applying the new medium of PanPastels - recorded from a live lesson. Learn how to create the illusion of space using atmospheric perspective in this course module. Learn how to draw a brilliant sunlit sky in this course module. Learn how to draw trees in a pastel landscape in this course module. Learn how to add rocks to a pastel landscape drawing in this course module. Learn how draw architectural elements in a pastel landscape drawing in this course module. Learn how draw water with pastels in this course module. Learn how silhouettes can be used to create focal points and enhance contrast in a landscape drawing. Learn how to add large qualities of pigment using the dry wash technique in this course module. Learn how water can be added to soft pastels to create unique effects in this course module. Learn the technique known as "scumbling" in which opaque, but light applications of pastels are applied to the surface. Learn the technique known as “feathering” in which short strokes of pastel are layered to create depth in color tone and texture. Learn how to use oil pastels to create a landscape painting. Learn how to draw the landscape with chalk or soft pastels. Learn how to use oil pastels loosely to create an Impressionist landscape. Learn how to use pastel pencils on black paper. Create a quick sketch of a bird using various forms of pastels. Create a drawing of a bird in this lesson on pastel pencils. Learn how to draw a rooster in this lesson that combines pastels and pastel pencils. Learn how to draw a cat in this lesson that explores the use of pastel pencils and traditional soft pastels. Learn how to draw a horse with pastels by layering multiple applications of tones and colors. Learn how to draw an owl with pastel pencils in this video demonstration and step by step breakdown. Learn how to draw a bird using conte in this full length video demonstration. Time lapse of a conte drawing of a bird from a recorded live lesson. Watch as oil pastels are used to create a convincing portrait of a dog in this two part series. Draw a lemon within a 30 minute time constraint. Draw a rose with pastels and pastel pencils in this lesson. Is Pastelmat paper right for you? Find out in this comprehensive review and drawing lesson. Keep your pastel drawings fresh by limiting your blending and using bold colors. Learn how to layer and blend pastels to develop a simple still life in this lesson. Learn how to draw a still life with pastel pencils. Learn how to use pastel pencils to create a still life of carrots. Learn how to use pastel pencils to create a still life of flowers. Learn how to paint a quick pastel still life using Rembrandt pastels in this recorded live lesson. Learn how to draw a still life with oil pastels in this two part video series. Learn how to draw with oil pastels in this demonstration of a drawing of a pear. Learn the basics of oil pastels in this simple tutorial that features a drawing of an apple. Take a look at drawing transparent glass with oil pastels. Learn how to approach abstract drawing with oil pastels in this recorded live lesson. Pastels come in a variety of forms including soft pastels, hard pastels, oil pastels, and pastel pencil. They can be used on a variety of surfaces including paper, canvas, masonite, and illustration board. Pastel drawings can resemble paintings when complete and sometimes are refereed to as "paintings", although the process is decidedly a drawing process. The medium is considered a traditional medium for creating art. Pastels are applied to surfaces using many different techniques that can produce a wide variety of effects and results. Quality can vary greatly from brand to brand, and is usually reflected in the price.